On the map, it was a 70-mile journey from Preston, but it turned out to be a lovely trip, to the client’s house, situated in the beautiful countryside above Holmfirth, well off the beaten track. 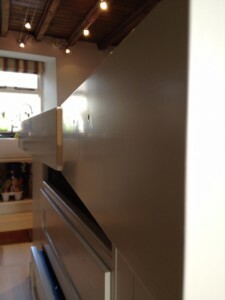 It was an in-frame kitchen that had been painted before, from new. Although it didn’t look too bad, Simon, the homeowner, wanted to protect its looks and keep on top of the maintenance. All the units were below the granite, so no ladders required – brilliant for someone like me who needs a stepladder on most kitchens. We talked colours and paint finishes. I also put the client’s mind at rest that I do actually know what I am doing. (with over 600 kitchens I would hope I can be trusted. I am not just any painter having a go, because the money sounds good!) I submitted my quote the next day. It was accepted. I duly booked the job in. We arrived on time, which, considering the traffic over the M62, was amazing! Straight away we started with the cleaning down, using our standard de greaser. We also sand at the same time with wet rubbing blocks. This guarantee’s a dust-free room and a perfectly smooth base. Once rinsed down with clean water, the units were allowed to dry. For the final prep step, units were given a thorough wipe with meths, to ensure a complete clean down. With filling completed and the primer applied and de-nibbed for a dead smooth base. The next day or so was spent applying the top coats. We always de nib and dust off and tack rag between coats, attention to detail is the bane of our job! The water-borne paint was diluted with water to ease the flow. I applied it with the foam sleeves and synthetic brushes. As you can see in the picture, the finish is nice and flat. 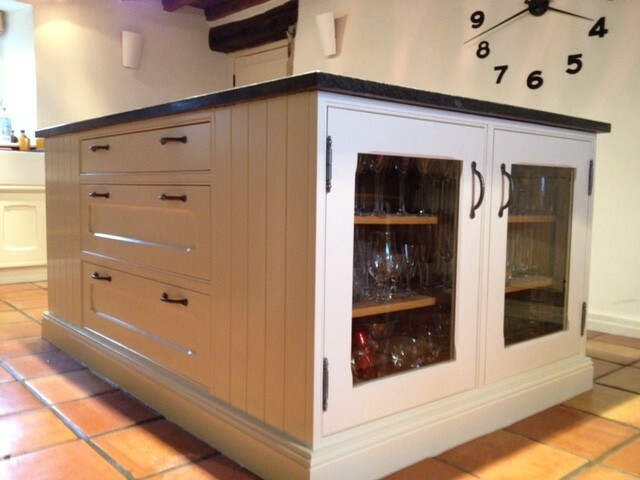 This kitchen now looks as if it has just been installed, and another clue as to why bespoke hand painted furniture really is a cost effective investment. Not just a great feature to improve the look of the hub of the home. But it is possible to change colours as subtly or radically as your taste allows – and “reinvent” or maintain your kitchen simply, for many years to come. 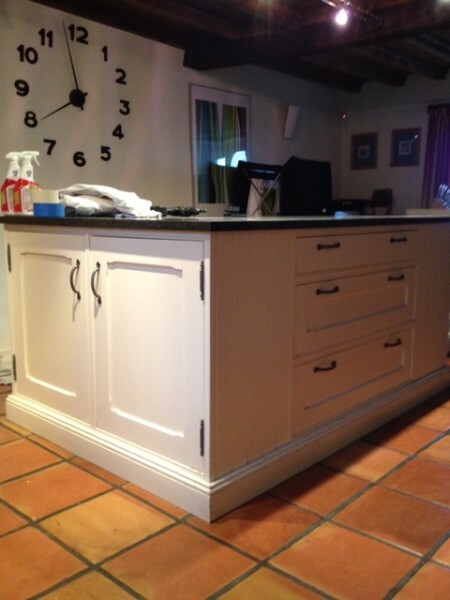 Take a further look at the procedure if you are in the market for a hand painted kitchen. Or to re-paint your bespoke kitchen. Specialist kitchen & furniture painters, JS Decor, we are the first port of call for hand painted kitchens for the Whole of the North West. You can get in touch via this link. We have been hand-painting kitchens since 1993, trading as JS Decor; and also have written regular tips for the Lancashire Magazine.